We need to be seen, we need to be heard. As MPN patients we are small in number – further diminished by petty divisions. But united we are seen. When we lift our voices together, we are heard. This is our time to finally get relief from the worst ravages of our blood cancer. Our chief problem – life destroying, career-ending, chronic and sporadic MPN-Related Fatigue (MRF)– was identified clearly six years ago.And then promptly fell off the world’s radar. The Fatigue Project is intended to help us make a great noise and wave a blood-red banner until we become a blip on medical research radar again. Until we get help! The Fatigue Project originated with, was funded, paid for, by MPN patients worldwide and is not affiliated with any special group. It started innocently enough when MPNforum published a request for supplemental funding last Autumn. 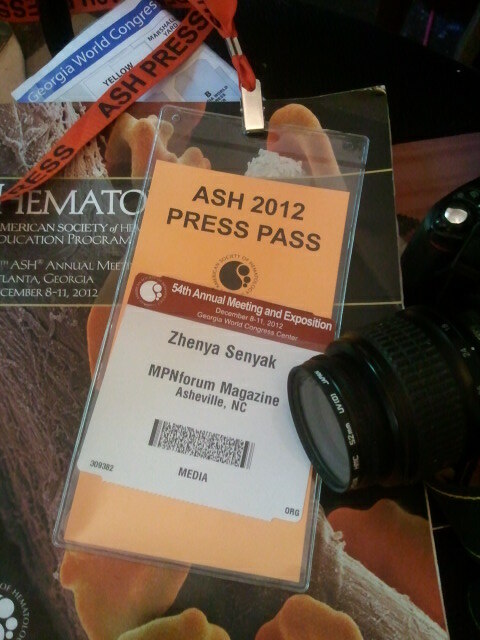 We had received press accreditation for the American Society of Hematology (ASH) meeting in Georgia and needed money for a computer, for gas, lodgings, and a low end video camera. The MPN community responded with more than $2200 from patients and caregivers– in amounts ranging from $7 on up. That was the beginning. I left for ASH as a journalist to report back to our MPN World. I knew our MPN World, rich in bright, warm-hearted people, is a sparsely populated blood-cancer backwater, largely invisible to the public. Even so, what I saw at ASH was astonishing. I left as a journalist and returned a crusader. Our MPN World and its concerns for relief from crushing fatigue wasn’t represented at this world assembly of 25,000 hematologists. True, we are only a small part of the hematology universe, a dim and distant orbiting planet in a galaxy of major blood diseases. But still, consider how strange that virtually all the scientific and economic muscle expended in our direction was limited to variations on the JAK inhibitor theme. Eminent professors, bench scientists and investigators all shuffled through the Conference corridors to report on their the well-funded JAK2 inhibitor trials…even though Jakafi, the first drug in this class, has been available for a full year. The prize for these billion dollar + efforts is not about us, not about relief from myelofibrosis. There are only 15000-18,000 or so of us in the United States and Canada, likely far fewer in Europe and Australia combined. Drug companies are investing heavily in scientists, medical facilities and clinical trials because control of the JAK-STAT pathway implicated in MPNs appears to be the key to many other major diseases affecting hundreds of millions, notably rheumatoid arthritis for openers..
We are left orbiting a neglected sector of the hematologic universe because we let it happen. We remained silent for six full years after we had certain knowledge our chief problem, our first concern. was MRF, MPN-Related Fatigue. Basta! Enough! Jakafi might reduce our swollen spleens. Interferon might normalize our counts and produce hematological remission. But with relief from fatigue, even temporary relief, we could get our whole life back. Creative action, sexual energy, lust for life all flow from lifting the heavy black curtain of Fatigue. Six years ago, Joyce Niblack and Dr. Ruben Mesa did the hard part. They – and their associates – proved Fatigue is our heaviest burden by far. So what happened? Life happened. And the discovery of the JAK2 v617F mutation happened. MPN progression happened. Our two principal supporters could not take the MRF struggle to the next level. Joyce, an MPN Warrior, grew increasing ill and frail. She succumbed to her MPN and its complications shortly afterward. ‘Dr. Mesa was one of the chief leaders of the scientific and clinical work associated with the first JAK2 discoveries and was a principal investigator and a primary interpreter of ruxolitinib (Jakafi) scientific results. Successfully pursuing this first drug to treat MF — plus publishing, teaching and administrative burdens at Mayo — his work on MRF took a back seat. And us? We just sat, silently in the darkness, waiting. . As a result we became invisible, the Missing Patient. We can find our voice again. We’ve been too quiet, too meek, too long. We need relief from fatigue – all of us with any blood cancer-related fatigue. Together, we can let our doctors know, our elected representatives, the drug companies, the NIH, the medical associations,foundations, the public. We are dying of Fatigue. It is a death by inches, a stealing of hours and days. The cost in suffering, the social and economic impact of MRF is immeasurable. Concerned physicians, powerful institutions and momentum is on our side. Now: Dr. Ruben Mesa and his crack team of therapists and analysts – Dr. Robyn Emanuel, Matthew Clark, Ph.D, AmyLou Dueck, – are back at our side. Dr. Michael Goldstein is with us. Dr. Claire Harrison, The MPN Research Foundation and MPD Voice is with us. We can’t afford to lose momentum again. Come out of the shadows and join the Fatigue Project. By enlisting in the front lines of the effort to beat MRF, you’ll get up to date bulletins and invitations to join events and trials. To join send a blank e-mail to MRFproject@gmail.com and put FATIGUE in the subject heading. That’s it. Fill out the MRF questionnaire.it’s the vital first step to help Dr. Mesa and the Mayo Clinic team and our supporters design the research. And pass the word. Raise awareness in your Facebook pages, in your Patient Support Groups, in your other on-line social media.